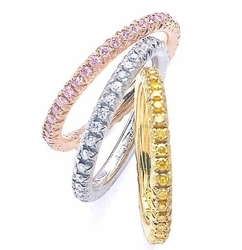 High Quality Cubic Zirconia Bands Collection! The Ziamond Cubic Zirconia Bands Collection featuring the finest quality diamond look cubic zirconia is comprised of an eclectic mix of cubic zirconia eternity bands, cubic zirconia anniversary bands and stunning designer style cubic zirconia wedding bands. 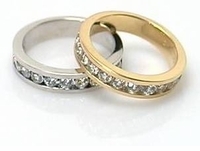 Different stone setting styles are represented in our Cubic Zirconia Bands Collection such as channel set bands, prong set bands, pave set bands, bezel set bands as well as other styles. Most of our man made diamond look bands are also available with accents of color of the world's finest lab created man made Rubies, lab created man made Sapphires and lab created man made Emeralds. 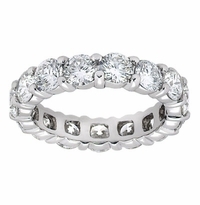 These cubic zirconia bands make the perfect accent ring to an engagement ring or wedding ring. Many of these bands can be worn on their own as well, giving you a beautiful look of a right hand ring or a wedding band that can be worn on it's own with out a solitaire. Most Ziamond Cubic Zirconia bands shown are available in 14k yellow gold, 14k white gold as well as 18k gold and luxurious PLATINUM via SPECIAL ORDER. Custom sizes and finger sizes smaller than a 5 or larger than an 8 can be made via Special Order. 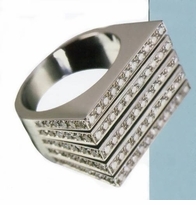 Please call us toll free at 1-866-ZIAMOND (1-866-942-6663) with an item number for a special order quote. For a custom design, please ask for our special order department. You can also initiate a Live Chat with a knowledgeable Ziamond representative.